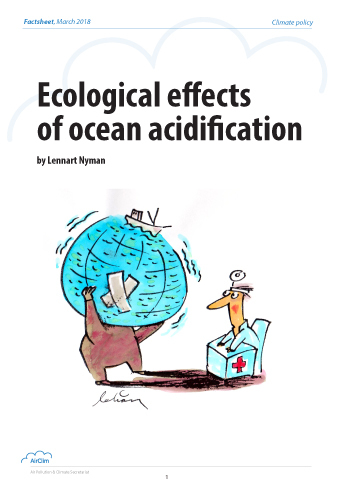 Because sulphur emissions have started to fall you may think that the danger of acidification is over. However, acidification continues to get worse in many areas - albeit at a slower rate than before. The problem will only be solved when emissions of acidifying pollutants fall well below the levels that nature can tolerate and neutralize. Back in the 1950s it was discovered that fish were disappearing from lakes and waterways in southern Scandinavia. Over the years, many thousands of lakes, streams and rivers have been affected by acidification, with widespread damage to plant and animal life as a consequence. The damage is extensive in large parts of Scandinavia, but also occurs in other parts of Europe and in North America. Sensitivity to acidification is greatest in areas where the minerals in the soil weather slowly. When the soil becomes acidified its essential nutrients are leached out, which reduces the fertility of the soil. The acidification process also releases metals that can harm the micro-organisms in the soil that are responsible for decomposition, as well as birds and mammals higher up the food chain, including man. The sensitivity of individual species to air pollutants and acidification varies. The most sensitive groups include fish, lichens, mosses, certain fungi and small aquatic organisms. 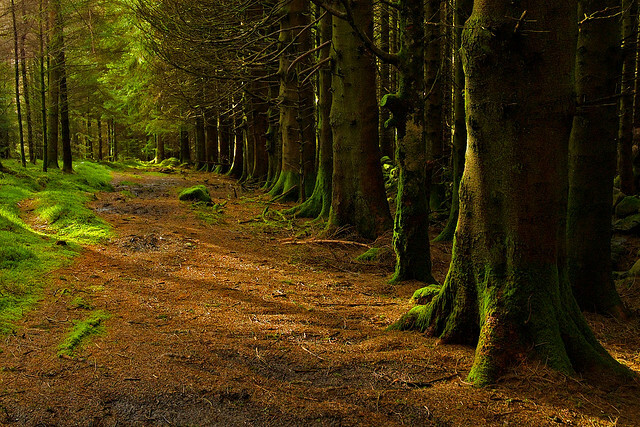 European surveys have shown that a significant share of the trees examined can be classified as damaged (the loss of leaves or needles exceed 25 per cent). This damage to the forest has many causes, but most researchers agree that acidification and/or eutrophication of the soil and high concentrations of ground-level ozone are important contributing factors. Corrosion of some important materials can be greatly accelerated by sulphur dioxide and nitrogen oxides. These are converted into strong acids which attack new and old buildings, bridges, monuments, rock carvings, etc. Worst affected are objects and structures of easily weathered materials, such as limestone and sandstone. The mobility of many metals increases in acid environments. The average levels of cadmium in groundwater have, for example, been shown to be three times higher in water with a pH value under 5, compared with water that has a pH above 6. The cadmium uptake of crops also rises when the pH of the soil drops. The concentrations of cadmium that parts of the population are exposed to are already close to the levels at which kidney damage can occur. Cadmium is also suspected of giving rise to bone embrittlement at relatively low exposures. Human exposure to other potentially toxic metals, such as aluminium and mercury, also increases in acidic environments. Acidification. Chapter 5 in the secretariat's book Air and the Environment (2004). Detailed information about emissions as well as effects of the harvesting of biomass. By far the most dominant cause of the acidification problem is the airborne deposition of sulphur, nitrogen oxides and ammonia. As the deposition of these acidifying air pollutants has been gradually decreasing over the last few decades, in some areas the harvesting of biomass through forestry practices is gaining in importance. Sulphur deposition, in the form of sulphuric acid, is generally the most important cause of acidification. Most sulphur comes from burning coal and oil, during which the sulphur in the fuel is converted into sulphur dioxide. Anthropogenic (man-made) emissions of sulphur in Europe rose sharply from the end of the Second World War until the end of the 1970s. Between 1980 and 2010, emissions from land-based sources in Europe fell by 85 per cent - from 53 to 8.1 million tonnes of sulphur dioxide a year. 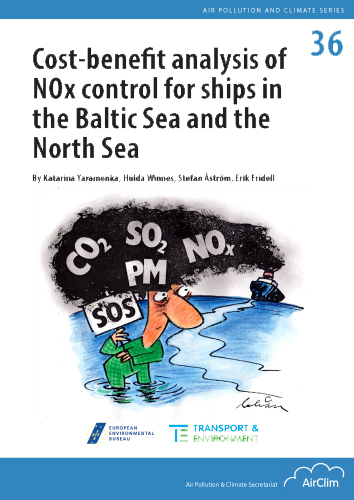 At the same time, however, emissions from international shipping in European waters increased from 1.7 to 2.4 million tonnes a year. Deposition of airborne nitrogen compounds - nitrogen oxides and ammonia - contribute to acidification and are also the dominant cause of eutrophication of many ecosystems on land and at sea. Nitrogen oxides are always produced during combustion. Emissions from land-based sources in Europe have fallen from 23 million tonnes a year in 1980 to 13 million tonnes a year in 2010, a reduction of 44 per cent. About half the emissions in Europe come from the transport sector, and most the rest from combustion plants. 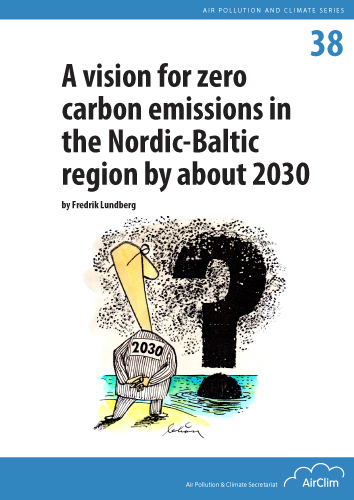 In the case of nitrogen oxides a large part of the emission reduction from land-based sources has been offset by rising emissions from ships at sea, which have almost doubled since 1980, from 2.4 to 4.0 million tonnes. The main source of ammonia emissions is agriculture. The amount of ammonia that evaporates depends primarily on how manure is handled during storage and spreading. According to statistics, European emissions have fallen by 34 per cent between 1990 and 2010, from 7.6 to 5.0 million tonnes per year. Finally the harvesting of biomass, i.e. normal forestry operations, also leads to soil acidification. 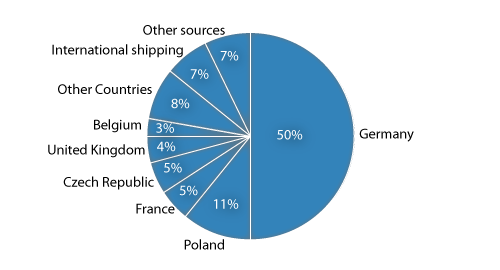 The figures presented here are based on EMEP data for 2010, and show the situation for two pollutants and two selected countries - Germany as an example of a net exporter of pollutants, i.e. one that exports more pollutants than is being imported, and Sweden as an example of a net-importer of pollutants. In common to both these countries - and in fact to most European countries - is the fact that most of the depositions of sulphur and oxides of nitrogen emanate from outside their own territory. 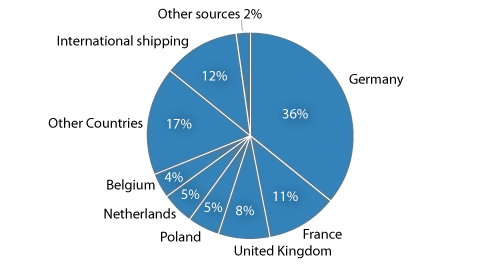 Another similarity is that an increasing share of the depositions originates from international shipping. 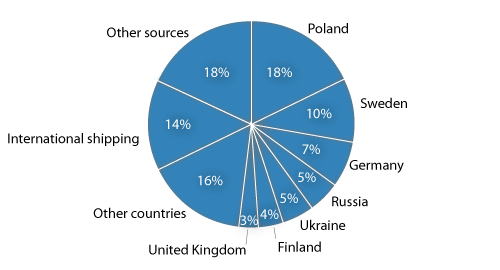 The origin of the deposition of sulphur in Sweden in 2010. The origin of the deposition of oxidized nitrogen in Sweden in 2010. The origin of the deposition of sulphur in Germany in 2010. The origin of the deposition of oxidized nitrogen in Germany in 2010. Ship emissions continue to increase. 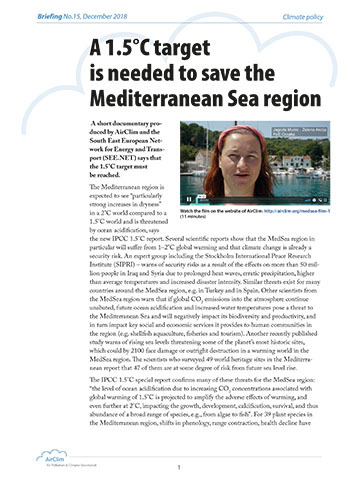 Article in Acid News 3/2012. Oxides of sulphur and nitrogen can be carried long distances - thousands of kilometres - by the air. This means that the problem of acidification recognizes no borders. 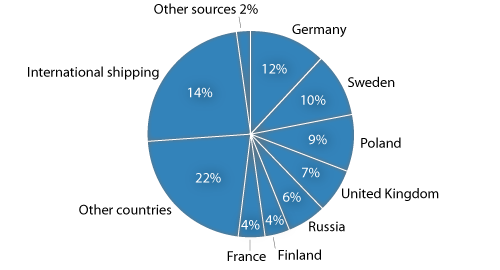 In Sweden and Norway around 90 per cent of the acid deposition comes from other countries and from international shipping. 1. The amount of acid deposition. 2. The resistance of the soil. When soil has a high content of easily weathered minerals it can absorb a relatively large amount of acid deposition without becoming acidic. 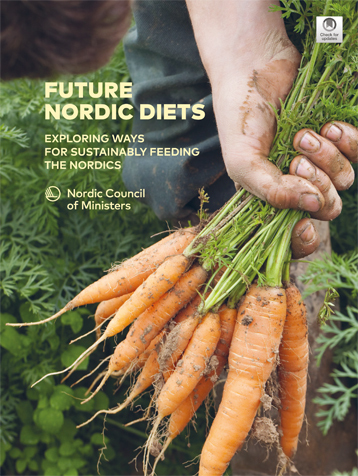 But if the minerals in the soil do not weather easily, as is the case in large parts of the Scandinavian peninsula for example, there is little natural resistance. If the resistance of the soil is low then lakes are also sensitive to acid deposition. The limits to what "nature can tolerate" are called critical loads. The critical load has been defined as "an exposure below which significant harmful effects on sensitive elements of the environment do not occur according to current knowledge". In 1980 around 43 per cent of natural environment in Europe were affected by acid deposition that exceeded the critical load. Emissions have however fallen since 1980. 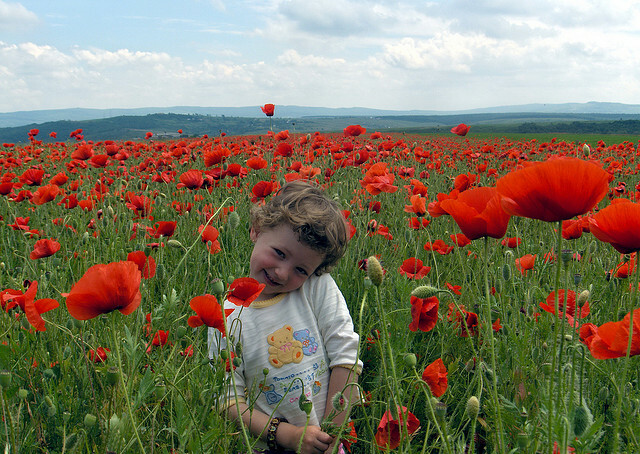 Recent calculations indicate that the exceeded area for acidification in Europe had shrunk to about 6 per cent by 2010. For the year 1990, more than 41 per cent of the ecosystem area in the EU28, or approximately 800 000 square kilometres, received acid deposition above the critical loads. By 2010 this had come down to 10 per cent (around 200 000 km2), and by 2020 this is calculated to be reduced further to about 7 per cent. Application of currently available emission abatement technologies (the MTFR scenario) could would result in only 3 per cent of the sensitive area being over-exposed (see maps below). 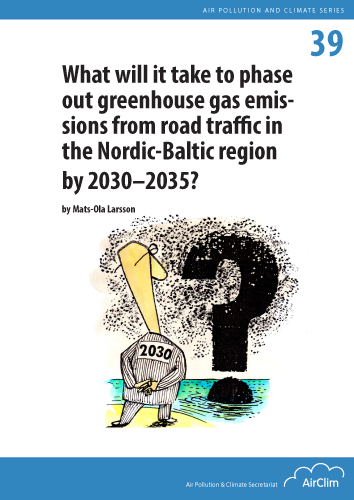 In order to achieve the political goal of non-exceedance of the critical loads it will be necessary to reduce emissions of sulphur dioxide and nitrogen compounds in large parts of Europe by at least 80-90 per cent compared with 1990 levels. It is also important to note that damage from acidification in an area can last for a long time, even when the critical limit is no longer exceeded. Percentage of forest area receiving acid deposition above the critical loads for acidification. Black colour = 100% exceedance, blue = less than 5%. For the emission levels in the year 2000 (left), and for two projected EU emission levels for 2020: Current legislation (CLE; centre) and Maximum Technically Feasible Reduction (MTFR; right). For details and country-by-country figures, see factsheet. Acidification. 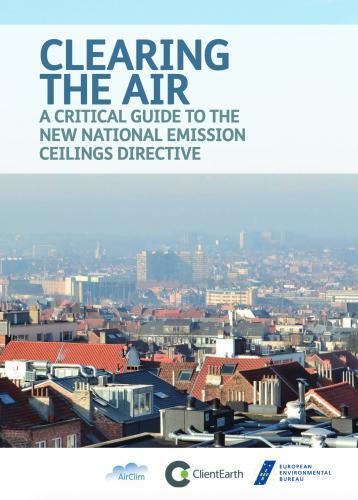 Chapter 5 in the secretariat's book Air and the Environment (2004). If finely ground limestone (CaCO3) is added to water it raises the pH and increases resistance to acidification. The liming of lakes and waterways is carried out on a large scale in Sweden and Norway. In Sweden around 7500 lakes and 11,000 kilometres of waterways are now limed each year. The goal of liming is partly to restore acidified lakes and waterways, and partly to increase the resistance of the lakes and waterways that are at risk but not yet affected. Because the water in a lake is constantly being replaced, liming must be repeated every few years. In running water, lime dosing equipment is used to continuously add lime to the water. In order to raise the pH in small waterways, and to increase the duration of the effect when lakes are limed, part of the lime is often spread on wetlands in the catchment area. This causes damage to plants, including killing off bog moss, but the area is limited and the benefits are generally considered to outweigh the harm. The acidification process in soils can be countered by liming. This raises the pH level and tops up reserves of exchangeable cations (increases the base saturation), while also reducing the concentration of free aluminium ions. Lime acts like a filter in the upper layer of the forest soil, where it can capture and neutralize future acid deposition before it has time to leach out base cations and/or dissolve toxic aluminium. The effect of the added lime penetrates slowly into the soil, at roughly one centimetre per year, but on the other hand persists for a long time in the future. The liming of soil can therefore help counter the acidification of surface water in the long term. 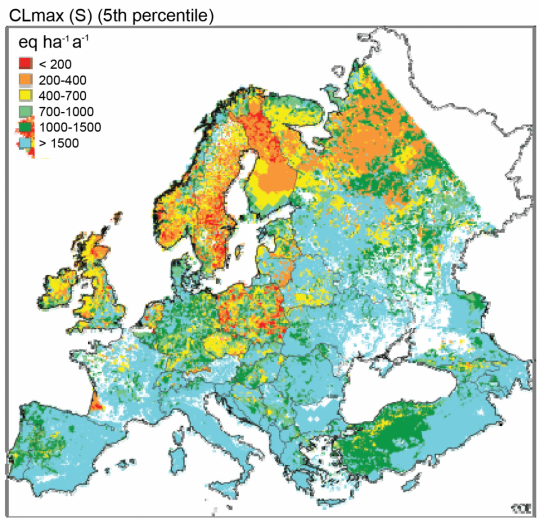 A dosage of 3-5 tonnes of lime per hectare has been estimated to protect soil from acidification for 20-30 years with levels of acid deposition in southern Sweden as they were in the late 1990s.